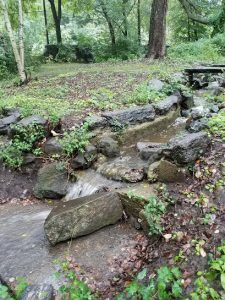 The Awbury Arboretum Association is pleased to announce that it has received a $390,000 grant from the William Penn Foundation. 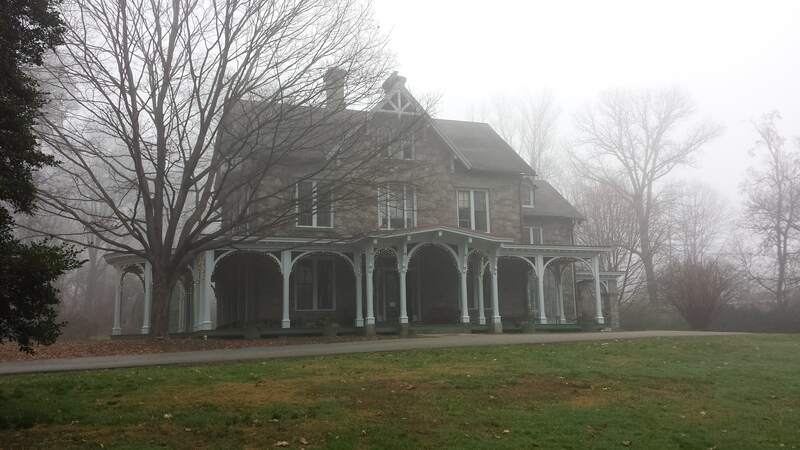 A small portion of the grant supported the purchase of a seasonal tent, tables and chairs for event rentals at the Arboretum’s Francis Cope House. The addition of these amenities enhances our ability to serve the community as a venue for gatherings of all types: weddings, reunions, baby showers, retreats, workshops, lectures, and more. Revenue from event rentals directly supports the stewardship of Awbury’s landscape and buildings and the many free programs we offer to the community. The majority of the Penn Foundation’s grant will support a 30-month long effort to increase public engagement and strengthen Awbury as a neighborhood asset. We want to learn more about our neighbors’ interests and needs and what we might need to change or adjust in order to serve all members of our community. Work supported by the grant will help Awbury identify barriers to access and ensure that we are reaching and involving all of our neighbors effectively. As summer began, Awbury sought proposals from several firms with the appropriate experience and resources to guide this effort. We have selected two outstanding local businesses – Media Culture Marketing and Community Marketing Concepts, Inc. – to lead different portions of the project. Naja Killebrew, Founder & CEO of Media Culture Marketing & PR, has over 20 years of experience as a marketing professional, and has overseen similar efforts for the Discovery Center, Ogontz Avenue Revitalization Corporation (OARC), Indego (Philadelphia’s bike share company), and the West Oak Lane Jazz Arts Festival. Phoebe Coles, CEO and Founding Partner at Community Marketing Concepts, Inc. also has over two decades of experience spearheading community engagement efforts for organizations including Keep Philadelphia Beautiful, PECO, and the Philadelphia Streets Department. 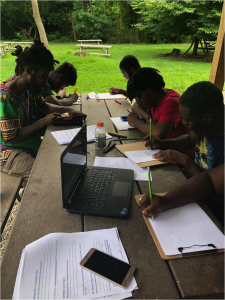 Ms. Killebrew and Ms. Coles have already begun researching, holding focus groups, and gathering the initial data necessary to build a “Neighborhood Inclusion Plan” – a document that will guide our engagement work over the grant period and into the future. 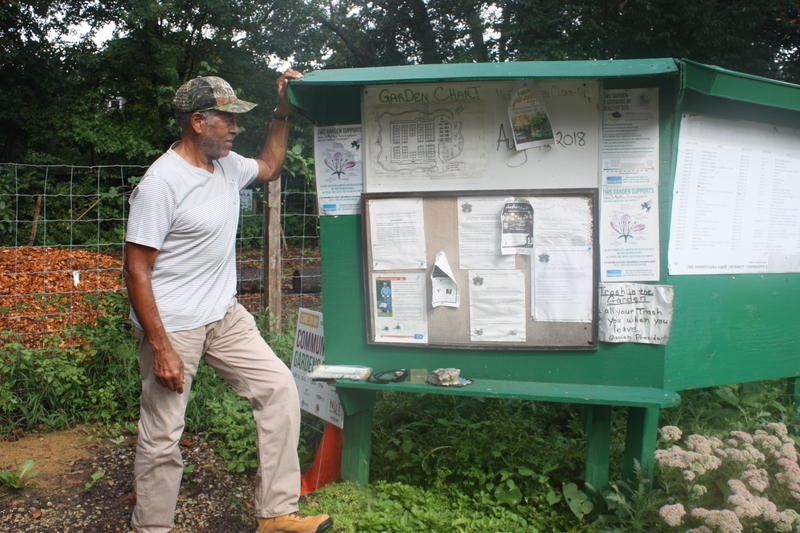 Established in 1977 with the Pennsylvania State University Cooperative Extension, the Community Garden at Awbury is the successor to Great Depression allotments and World War II Victory Gardens. 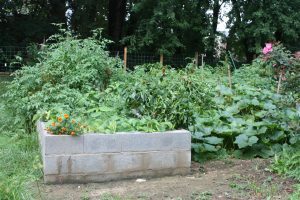 For a small annual fee, local gardeners get the use of a 10’x20’ plot in the Agricultural Village side of the Arboretum. Local residents raise flowers, fruit and vegetables, and run community events that raise awareness about gardening and food. 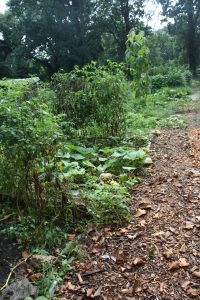 What makes this garden even more special is that it is managed by a coordinating committee of neighbors of Awbury Arboretum. This year, through funding from the East Mount Airy Neighbors (EMAN) Community Fund , the Garden was expanded from 60 to 71 plots by moving the fence an extra 10 meters outward on all sides. 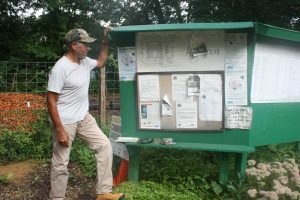 I recently spoke with Eldredge Ragsdale (known to his friends as “Rags”), a longtime neighbor of the Arboretum, the current President of the Community Garden Association, and a newly-minted Board member. He was excited about the recent improvements, and took me on a tour of the new features of the Garden. 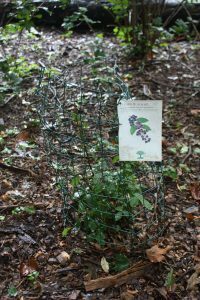 The project started back in the spring, when the Awbury landscaping crew put in new raised beds, and then in April Ragsdale joined them in planting nearly 100 new berry bushes and fruit trees along the woodland walk that encircles the Garden. 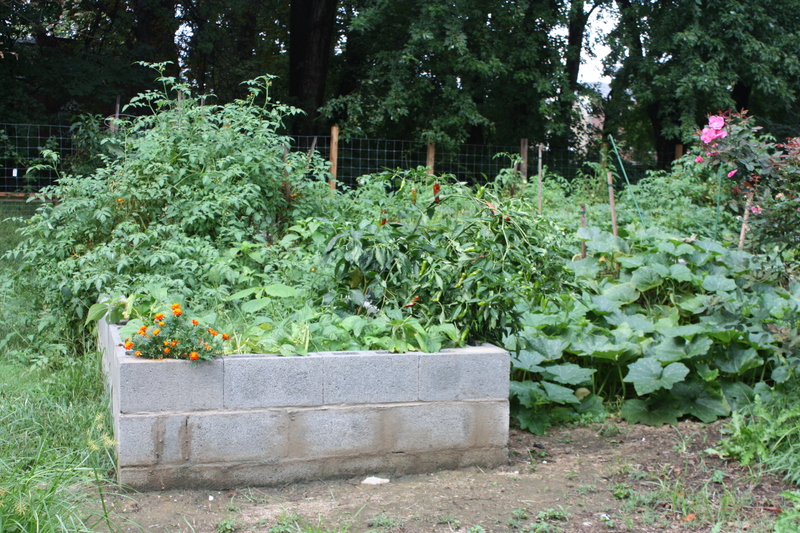 The Community Garden currently contains 71 plots, tended by 65 gardeners. At any given time, there is a waiting list of 10-15 people hoping for a plot of their own. In addition to waiting for someone to leave, they have to undergo screening. Ragsdale oversees a group of six coordinators, each of whom has responsibility for 7-8 gardeners. It’s their job to make sure gardeners follow the rules, keep their plots tidy and weeded, keep trash picked up around the garden, and participate in community events. When I visited, it was the tail end of the growing season. Some of the plots had gone to weeds after all the heavy rains, but some still had a few vegetables clinging to vines. Unfortunately, not all of it has been harvested by humans. “The birds get theirs, the groundhogs get theirs,” he ruefully admitted. 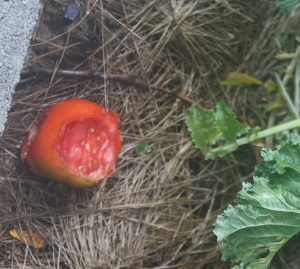 “The squirrels give us the most problems: [they] take one bite of 3 or 4 tomatoes and then just leave them on the ground. But that’s nature!” he laughingly concluded. The Community Garden sponsors a great number of events: cooking demonstrations, where people are taught how to cook with fresh herbs; soil emendation lectures, where gardeners are urged to get their soil tested and learn what to do with the results; and plant give-aways, where the community is invited in to help themselves to surplus vegetables. Most important, he stresses, is participation in the Pennsylvania Horticultural Society’s City Harvest program. Seedlings are distributed to 140 urban gardens around Philadelphia to grow food for families in need. Several times a season he personally takes all the crops raised for this program and delivers them to the Lonnie Young Rec Center, our local drop-off for the City Harvest program. 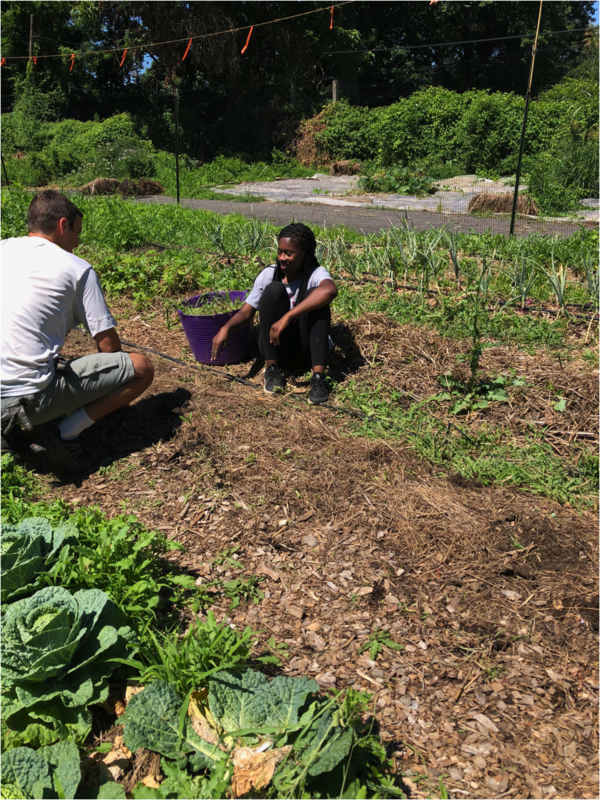 Ragsdale also works with youth volunteers; as far as he’s concerned, this is the highlight of his job: inspiring a love of gardening in young people. There are the local children from churches and youth groups, and then some come from as far away as North Carolina, Wisconsin, and Virginia. 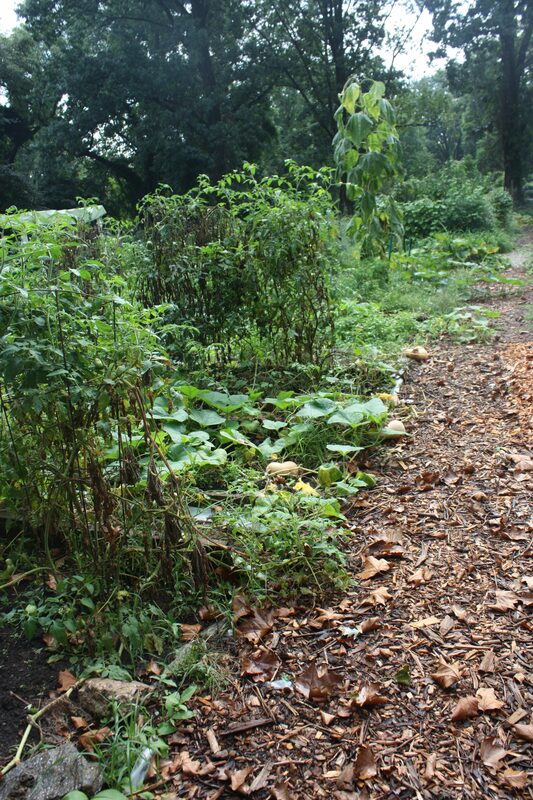 They typically spend at least two weeks working in community gardens all over Philadelphia. If you want to know about events in the Community Garden, follow its Facebook page here. Awbury has a long history of tribute gifts. 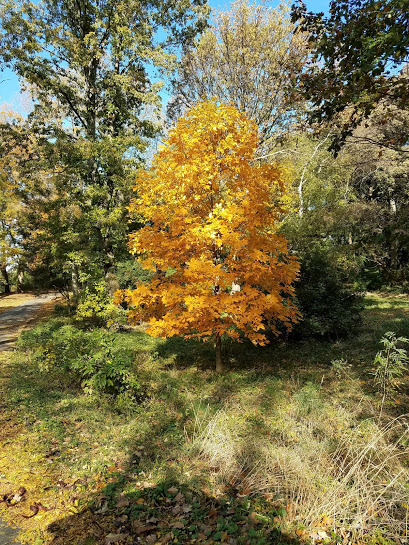 We’re grateful for the many people who have celebrated important life events and honored passed loved ones by planting a tree, donating a bench, or supporting the Arboretum financially. 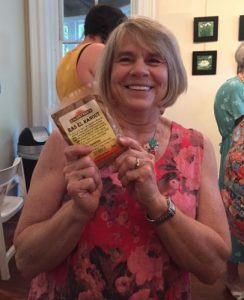 Recently, Landscape Manager Karen Flick, together with the Landscape Committee, worked to reorganize the catalog of past gifts and to create a menu of donations from which future supporters can choose. They composed a list of trees that would add to the beauty and health of the Arboretum, as well as areas where these trees would flourish. Options include beautiful and fragrant witch hazels, gorgeous magnolias, towering firs, and many more. Click here to view a map of planting areas and here to read more about trees needed in those areas. The act of planting a tree requires full involvement. The planter’s physical and mental devotion create an influential experience, connecting all who participate with the tree, one another, and themselves. Trees are planted for those who have positively affected the lives around them. The continued care and nurturing of the tree reinforces the enduring growth of that lifelong impact. 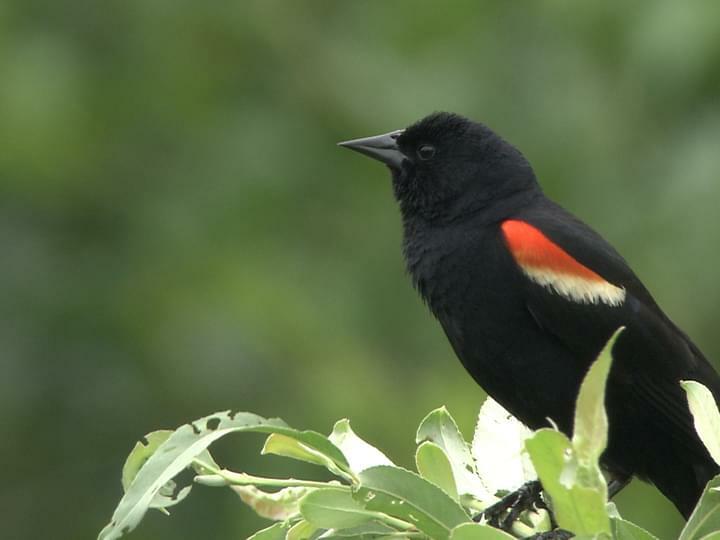 The benefit of a tribute tree extends to its surroundings—its fellow plants and animals, the overall environment, and the community of people who visit it. 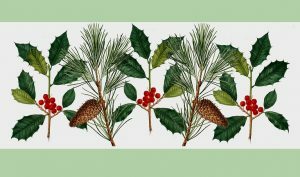 For groups not interested in or able to donate a tree, the Landscape Committee has added a selection of plants, including shrubs and perennial flowers. 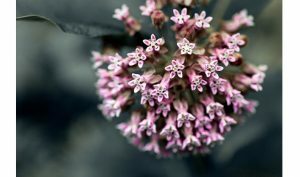 We are especially hoping to expand the stretches of milkweed in our meadows: not only is blooming milkweed a lovely sight as visitors wind up the driveway, but it is also an essential plant for local pollinators like the monarch butterfly. Tribute gifts are a unique and thoughtful way to commemorate a wedding, an anniversary, the birth of a child, or the life of a loved one. 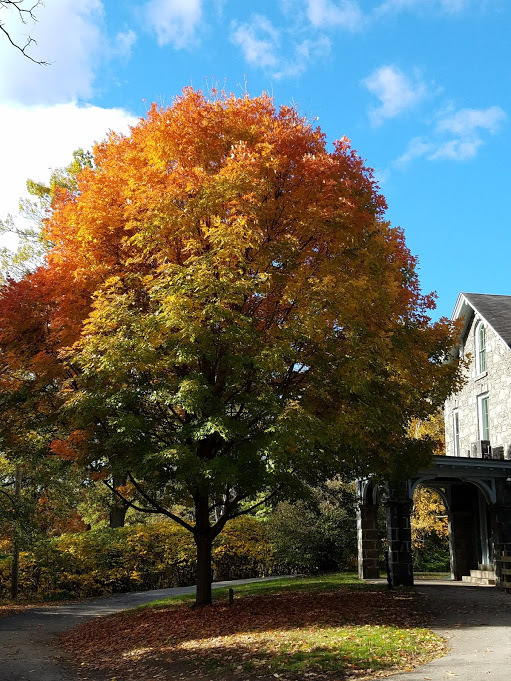 Your personalized tribute gift supports Awbury Arboretum, the preservation of our historic house and landscape, and our mission to connect our urban community with nature and history. Click here to learn more. 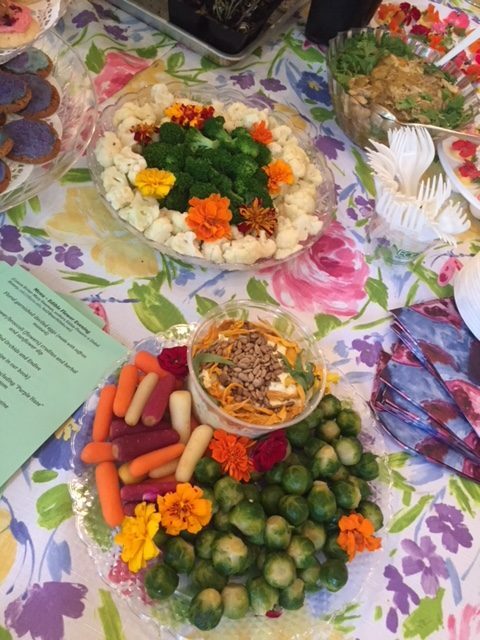 Experience the Issue—a dine and discuss event featuring Charlyn Griffin of Soil Generation and Pennsylvania Horticultural Society (PHS) with Edible Philly and Birchtree Catering. Edible Flowers—a tasting event with author Constance Kirker and PHS—wow! 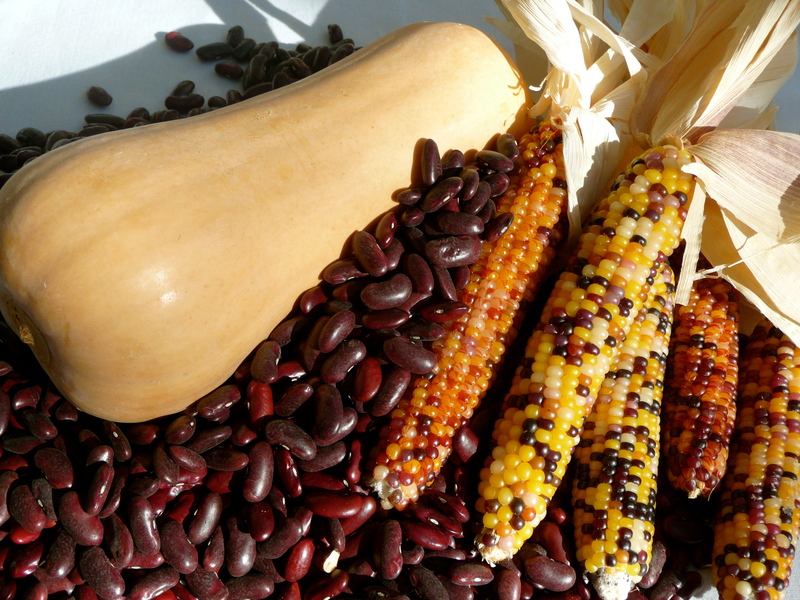 I thought I knew a lot about wild edibles, but I learned SO much more! Constance is coming back to Awbury in November for “Sacred Sweet Tooth,” an exploration of four religions and confections; this promises to be a treat in all senses of the word. 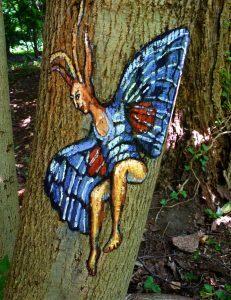 AdventureWoods—our first season hosting open Saturdays in our natural playground has introduced one of the Arboretum’s newest features to over 500 children and adults. 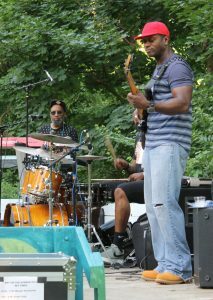 Awbury Live was our free open-air soul and R&B concert, held in the McNabbtown meadow and featuring the band The Right Tyme Players. 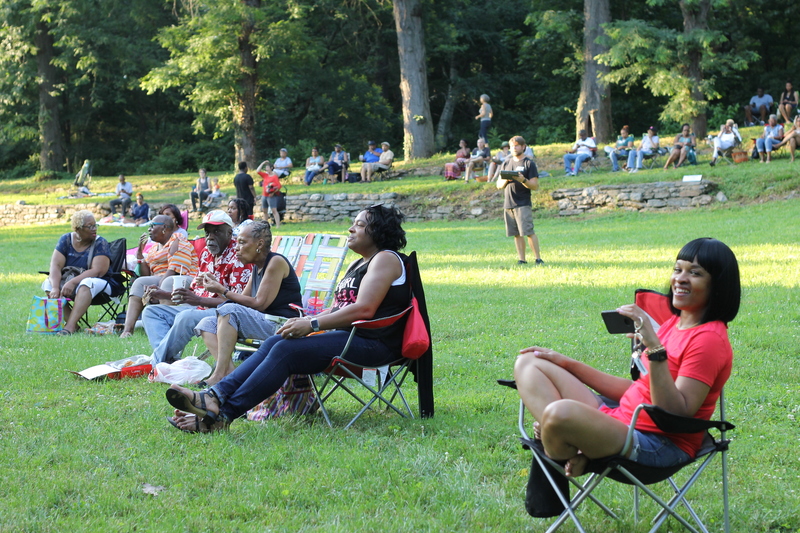 People showed up with blankets and lawn chairs and had a wonderful time. And who could forget Summer Camp, with our perennial favorite, Camp Katniss, as well as the return of Wizarding Camp, Cooking in the Cope House Kitchen, and Advanced Wilderness Survival, and a new offering, Welcome to Wakanda! The kids had a great time playing outdoors in all weathers. As autumn rolls in we are looking forward to art, community celebrations, dinners and more! 9/25—This evening kicks off the first of three make your own jewelry classes with Y’vonne Page-Magnus. She will be teaching techniques for beginners, creating jewelry with semi-precious stones, freshwater pearls, and wire. 10/13—Harvest Fest 2018. Come enjoy hayrides, face painting, live music, cider pressing, kids’ activities, pumpkins, apples, goats, and much, much more! Fall is officially approaching as evidenced by the asters, goldenrod, and salvias’ late summer blooms taking their turn to add splashes of color to the landscape. Each season we focus on what is in bloom, but it is not only flowers that draw our attention in Awbury’s landscape; as fall arrives, the trees and shrubs have a chance to show off their massive displays of vivid color. 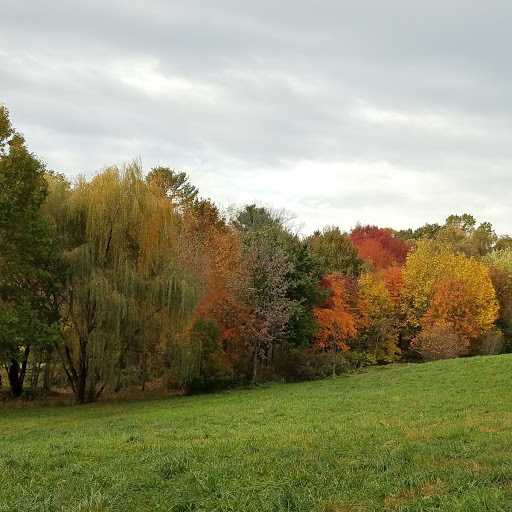 In October and November, Awbury Road will provide an array of colors as visitors admire the English Landscape all around them. Be sure to venture along the paths in the English Landscape as the seasons change and new vistas open. One favorite panorama is where the shadowy Beech Hollow path ends by opening up at the top of the meadow and places the viewer looking down on the watercourse’s canopy. In the fall, the mass of green trees in the watercourse turns to a blend of reds, oranges and yellows. 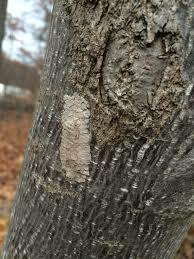 Keep an eye out for the black gum in this mass. Black gums’ waxy leaves turn a glowing range of orange to red. Take a closer look as spicebushes that fill the understory turn bright yellow and other woody plants like the clove currant’s berries ripen to crimson clusters. 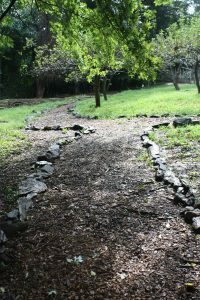 The paths winding throughout the Arboretum open up to many different scenic vistas, but also provide views along the way. 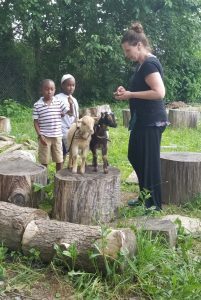 After a brief but drenching rainstorm blew over Awbury Arboretum’s Agricultural Village, a green gem nestled among Germantown city blocks, I left the sanctuary of my car to meet several new members of the community. Karen Krivit, caretaker and self-appointed “mom” of the new tenants, met me outside of what she calls her “office,” a space she shares with them as they grow accustomed to city life. They do have everything they need, though—straw bedding, various obstacles to climb, and plenty of greenery to feast on. 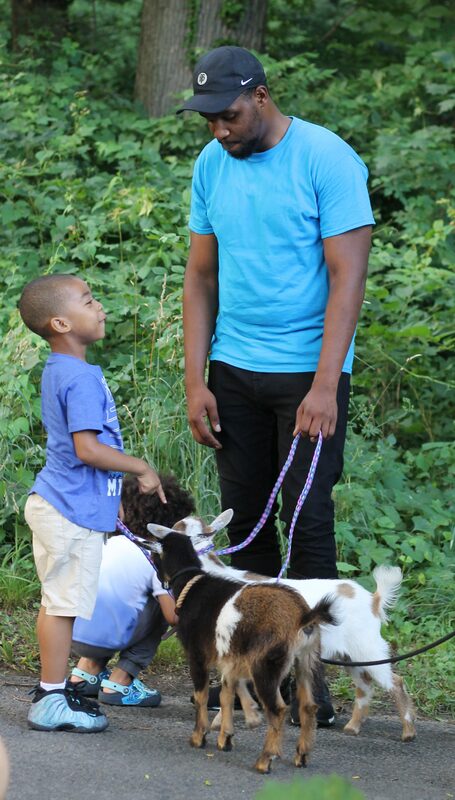 Krivit, a former social worker, is the director of the Philly Goat Project, an initiative started this past February. The goats have given Krivit and her team a special conduit to connect with people on a personal level. 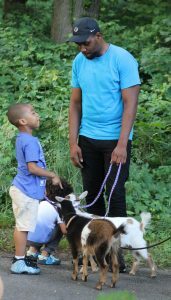 The goats serve many purposes on Awbury Arboretum’s grounds, including grazing on weeds and invasive plants, engaging in therapy and yoga, and generally bringing the community together to learn about how to interact with these animals. While Krivit was giving me a brief introduction to the project, a call came through on her cell phone. “Can you run with me?” she asked, hanging up and starting a brisk jog. Before I knew it, we were splashing down a dirt road filled with puddles. We entered a clearing a shortly after and there, standing just outside of her pen, was a cream-colored baby goat named Ivy. “They hate the rain,” said Krivit with a laugh, who rounded the wet goat up with her siblings, Bebito and Anthony. We led the three kids up to a bigger pen where two adult goats, Oonagh and Oliver, were eating hay under a patchwork of canopies providing cover from the rain. Krivit pointed out that the entire pen used to be overgrown, but it didn’t take long before the animals left the pen void of weeds, honeysuckle, and poison ivy. The same plant that gives most humans itchy rashes is Ivy’s namesake. Goats are essentially natural lawncare, and Awbury is happy to take advantage of their voracious appetites. “The goats are making it possible to clear overgrown areas,” says Awbury landscape manager Karen Flick, explaining that steep hillsides can now be maintained. While working with manual tools on high grades can be dangerous for people, the goats don’t seem to mind the work. Grazing is only one of the functions the goats fill. There’s a new trend in the fitness world these days called goat yoga, and it’s about as straightforward as the name sounds: miniature goats are allowed free rein to climb on the backs of and cuddle with those practicing yoga. Awbury is already offering classes where you can join the fun, and all ages and levels of experience are welcome. 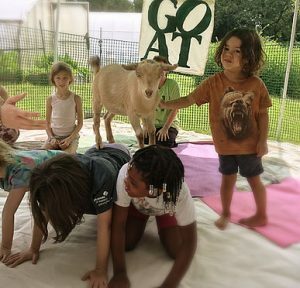 The fees for goat yoga fund many of the free community events that Philly Goat Project runs throughout the week, including neighborhood programs that allow kids to walk and help train the goats. Krivit hopes that the yoga will lead people to become more engaged with the project in the future. Besides grazing and yoga, the Philly Goat Project uses goats to bring people together in what Krivit called a “platform for community engagement.” “The goats really are a gateway to nature, the environment, and history,” Krivit explained, as she often uses her animals to segue into topics of environmental stewardship and climate change. 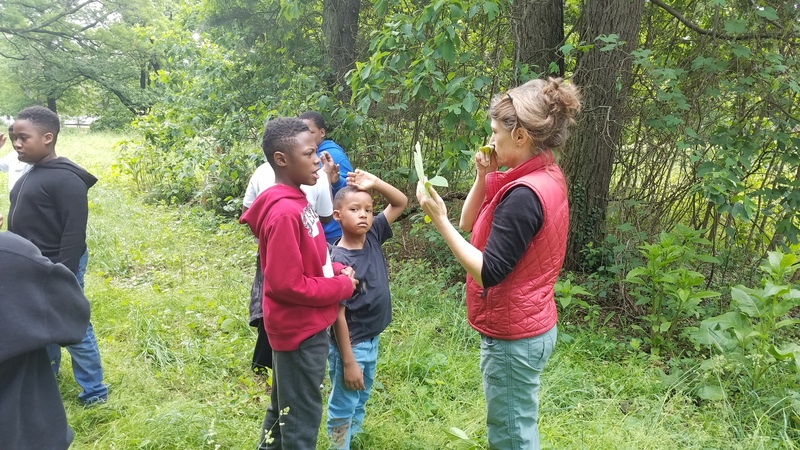 This past spring the Wissahickon Charter School afterschool Environmental Club, coordinated by Liz Biagioli, visited Awbury multiple times to learn about the many birds who benefit from Awbury’s green space in the middle of a densely urban area. 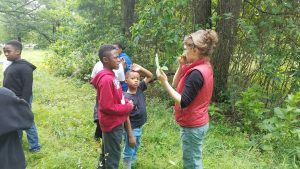 The students learned basic bird identification through observation, made connections between adaptations and habitat, examined nests and even learned a few bird calls. Each of the 12 students kept a birding journal that encouraged written and drawn observation. One highlight of the program was watching the performances of the resident redwing blackbirds in the wetlands area. The students enjoyed imitating their antics as well as those of some of the other Arboretum residents including red-tailed hawks, mourning doves, and red-bellied woodpeckers. A check of the bluebird boxes scattered throughout the Arboretum indicated some signs of nest building but, unfortunately, no bluebirds currently in residence. The final day included a ‘quiz’ of 10 birds that are seen frequently at Awbury and, somewhat surprisingly, all the students were excited for the quiz. Everyone received a perfect score, and we celebrated with a special snack and some playtime in AdventureWoods. It was a great experience—a big thanks to Liz and the students for their enthusiasm. As I reflect on this past summer’s volunteer activities, the theme that ties them all together is teamwork. With rain followed by searing heat, the Awbury landscape management’s seasonal task list grew by leaps and bounds. In groups both small and large, our volunteers took on general maintenance: weeding the new flower beds around the Cope house and removing invasive ivy from trees throughout the English landscape. 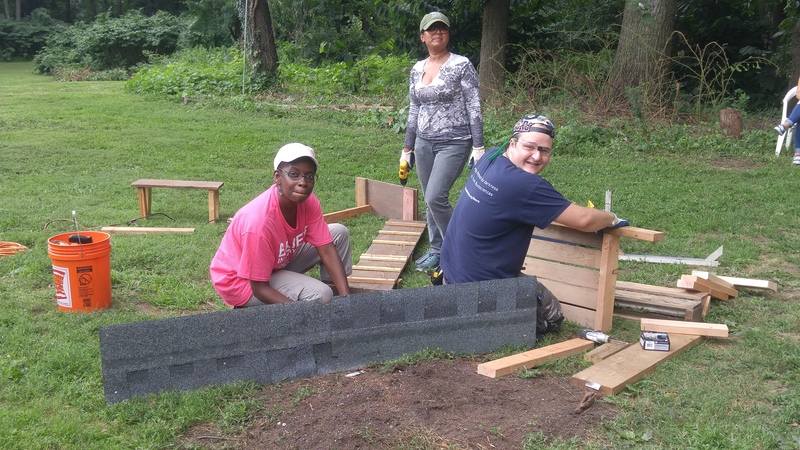 And then there were Awbury’s restoration and improvement projects, for which volunteers partnered with Landscape Manager Karen Flick’s crew and other Awbury groups. They helped improve the grounds and trails surrounding the community garden: planting a food forest designed by Karen, removing invasive shrubs, vines, deadwood, and rocks from an abandoned construction site, and laying new trails. Volunteers also took on another major landscape project, in the wetlands and meadows across from the Ag Village’s Washington Lane entrance: they painstakingly removed by hand invasive plants that were growing too close to trees, so close that the landscape crew could not access them with motorized equipment. Woodworkers helped the pollinator gardeners build a new fence line, and added or fixed many new fixtures to the Philly Goat Project compound, TLC’s storage, and the Ag Village Ed Center’s homeschoolers’ playground. The pollinator gardeners gave a tour called “Stars in the Garden”; in between adding new plants from a Weavers Way grant which are doing marvelously, and potted plants in front donated by PHS City Harvest. Two new beds behind the potting bench are shaped like a figure eight, and feature a beautiful black walnut in the intersection. 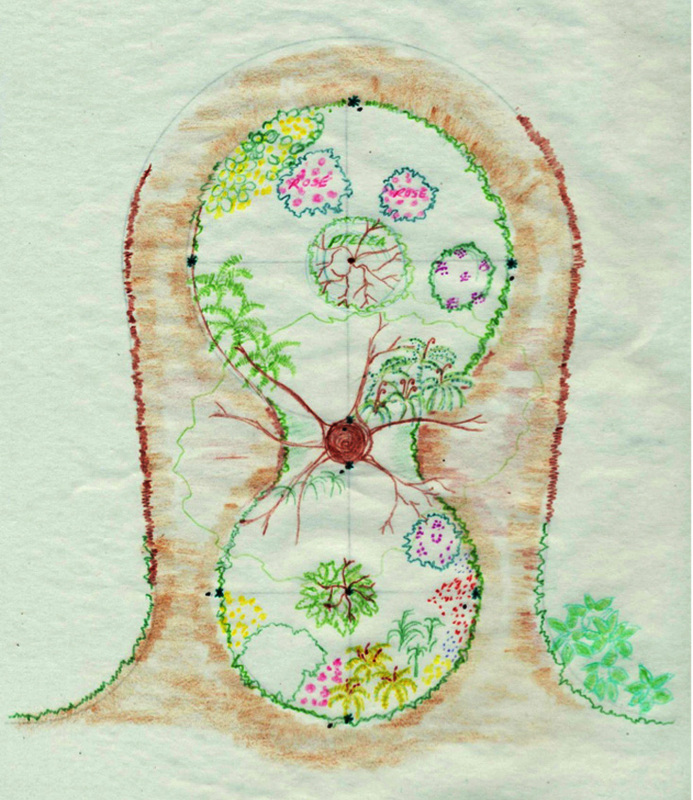 The design was created by Richele Dillard, and her drawing is pictured here. Awbury Woodworkers, Awbury Pollinator Habitat gardeners, Awbury Community Garden volunteers, Weavers Way’s working members, SPIN Inc., Wedge, Stepping Stone Scholars, JusticeworX, Outward Bound, DePaul Youth, Scott Arboretum interns, Philadelphia Orchard Project volunteers, AmeriCorps, Penn State Master Gardeners, freshman orientation students from Arcadia U, LaSalle U, and Jefferson U. After the summer, volunteers took a deep breath, and started off the fall by welcoming visitors to the Philadelphia Film Society’s screening of “The Prophet.” Pollinator gardeners are now hosting a nature photography contest called, “Garden Life Through A Lens,” featuring pollinator garden wildlife.If you want to get involved in volunteer activities this fall, opportunities abound. 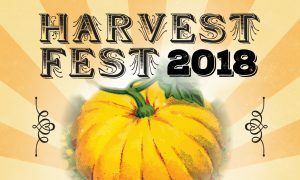 It’s not too early to sign up to as a Welcome Committee volunteer for the annual Harvest Festival in October and the Winter Greens Sale in December. There are also a couple of Second and Third Saturdays left, as well as handcrafted gifts by the woodworkers for the winter sale. Finally, Awbury volunteers are also welcome to participate in the PHS Tree Tenders’ Germantown tree planting on November 17. Come get involved! While we are constantly working to improve the Arboretum’s landscape, we also find we need to keep improving our physical facilities to meet our expanding program needs. Toward this end, the past 12 months have been a time of extraordinary physical growth and change. The most significant landscape improvements made in the last few months include the first phase of the restoration of the pond and wetland area—the precursor we hope to the major restoration of the pond—the installation of dramatic new gardens surrounding the Cope House, the expansion of the community garden plots, and a new trail around that portion of the Agricultural Village. The three most significant physical improvements made to provide for new programmatic offerings were a new playground inside the Secret Garden, a livestock area for the Philly Goat Project, both of which were featured in earlier editions of The Leaflet, and a new shed to house all our new rental equipment. 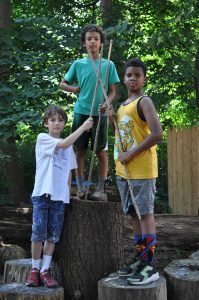 AdventureWoods, the new nature playground, was open several days a week this past spring and summer, provided increased activity opportunities for our camps and field trips, and can be rented for a special organization, family or birthday party. The new livestock area in the Agricultural Village is home to a small group of goats that will be part of Awbury’s landscape crew (goats are pros at clearing invasive plants, including poison ivy), enhance the learning experience for kids on field trips, and be the focus of some new programs like Arboretum Walks with the Goats, and goat yoga. 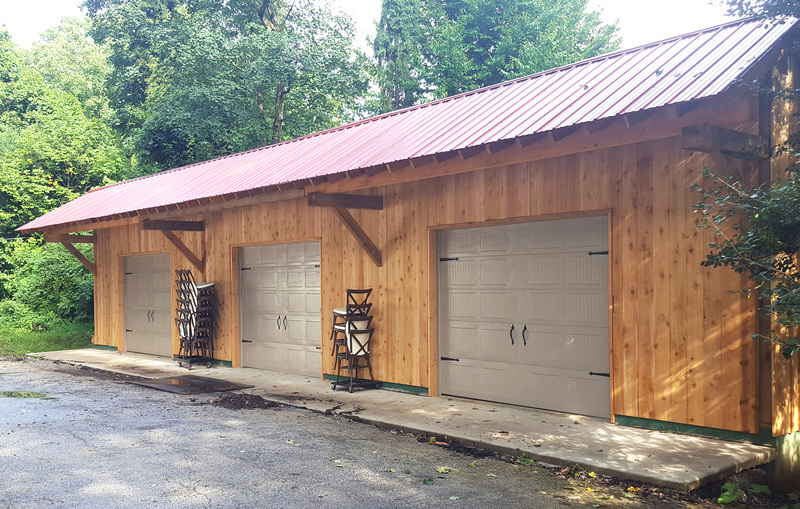 The biggest new structure is the new 15’x60’ shed we built next to the Cope House parking lot this summer, which will serve our growing social rental business. While our new tent pavilion can accommodate events with as many as 175 people, we didn’t have the storage for the accompanying furniture, and clients had to rent it separately. Now our shed provides storage for our newly purchased chairs and tables that large weddings and other gatherings require. No more trucks pulling in to drop off furniture and returning to take it away. Given all of these new features and facilities, if you haven’t visited the Arboretum recently, you may want to come soon to see some of these improvements for yourself. In 2017, Awbury Arboretum cleared the Wingohocking Creek riparian habitat and replanted over 300 native trees and shrubs. This restoration kick-off was the beginning of an extensive effort to revitalize the full wetland habitat. Most people are not aware that the Wingohocking Creek is piped under Washington Lane and resurfaces in our historic wetland area. Spring of 2018 launched the clearing of the historic watercourse. Designed by Arthur Cowell, the watercourse, consisting of a stream connecting an upper and a lower pond, was fully installed by 1920. Those familiar with the Awbury landscape have a great fondness for the watercourse’s elegant blend of designed landscape and natural habitat. On the other hand, visitors have been baffled by its existence due to the rapidly growing invasive vines and grasses, which have kept it all but hidden and challenged all efforts of maintenance. 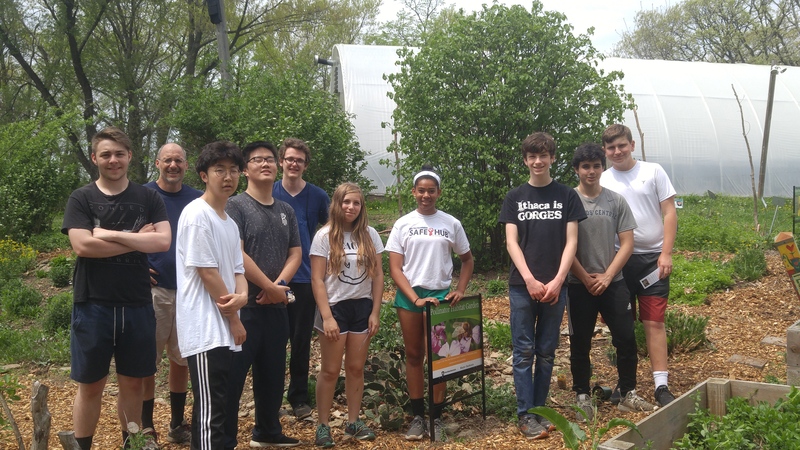 This past spring, Awbury Arboretum’s landscape staff and many volunteers, including several days with AmeriCorps workers, undertook the daunting task of clearing the invasive vines, trees, shrubs and perennials that choked the watercourse. The clearing began at the top of the meadow’s hill on the far eastern side of the property, where rainwater gathers and runs down to the watercourse. 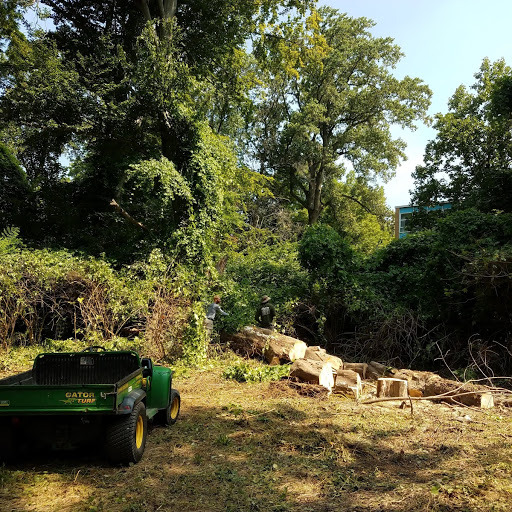 Partnering again with Umar Mycka’s Poison Ivy removing team, Awbury was able to clear waist-high patches of poison ivy running the length of the watercourse. The invasive clearing is coming to an end just as summer winds down, but this in no way marks the winding down of the Awbury wetland restoration. 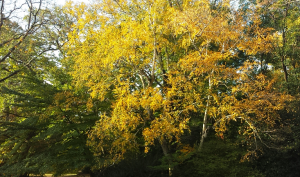 There are more phases lined up, like tree plantings this fall, and the maintenance pruning of the State Champion River Birch. In addition, there are more phases still to plan, like the restoration of the ponds and replanting of the upper bog area. Awbury looks forward to the continued enthusiasm of staff, volunteers, and partners as progress pushes forward for a full wetland habitat restoration. 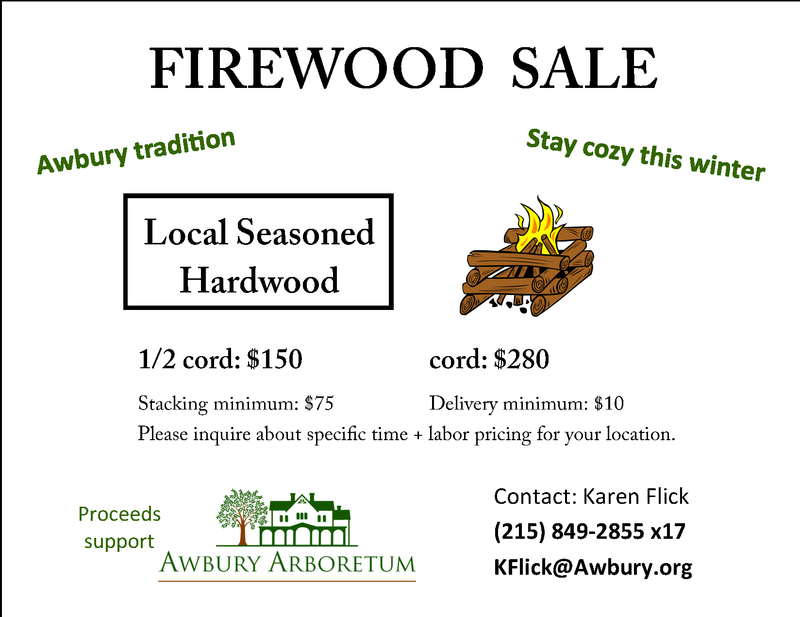 If you are interested in getting involved, please contact Awbury’s Landscape Manager Karen Flick at KFlick@awbury.org. In the five years since we first envisioned this program, the Teen Leadership Corps (TLC) at Awbury has successfully created a vibrant and popular year-round program where high school youth and neighborhood staff and volunteers work together to grow vegetables, to cook those vegetables with grains and beans while learning about “green & sustainable,” to practice entrepreneurial skills by making and selling products from our farm, and to engage with our community by hosting and attending events where we exchange knowledge about food, farming, cooking and micro-enterprises with others. This summer at the Awbury Agricultural Village we have been busy planting possibilities and harvesting skills indoors and out. 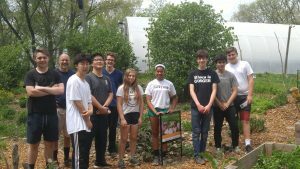 TLC at Awbury now tends a small farm made up of several market gardens, raised and vertical grow beds, and a flock of 14 hens, 5 turkeys, and dozens of high school-age youth. 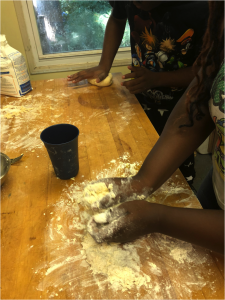 Our summer service learning program again had 15 students, paid for their work with us through the Philadelphia Youth Network, in administrative partnership with the Federation for Neighborhood Center’s Teens4Good Farm. Summer is filled with huge harvests, cooking projects, product making, daily shared meals, and discussion—it’s a time to learn while doing. Our TLC team expanded this summer to include two seasonal educators supported by funding and hands-on assistance from Digital OnRamps. 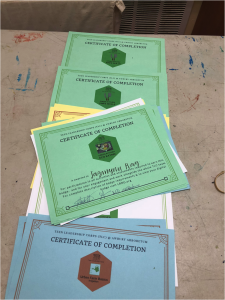 This allowed us to make strong headway in our badge program, which separates the many skills our youth gain through the meaningful day-to-day work we do each season into discrete badges that they are awarded upon completion of specific activities or assessments. Students can earn micro-credentials and create a digital portfolio of lessons learned and projects completed. We created leader guides and assessment metrics for each project and program, as well as support and training tools for staff and volunteer educators; we researched and curated resources for youth to engage with on-line and in person and had youth involved in all aspects of the project. All our TLC summer interns earned multiple urban farming, cooking, and community engagement badges and certificates. 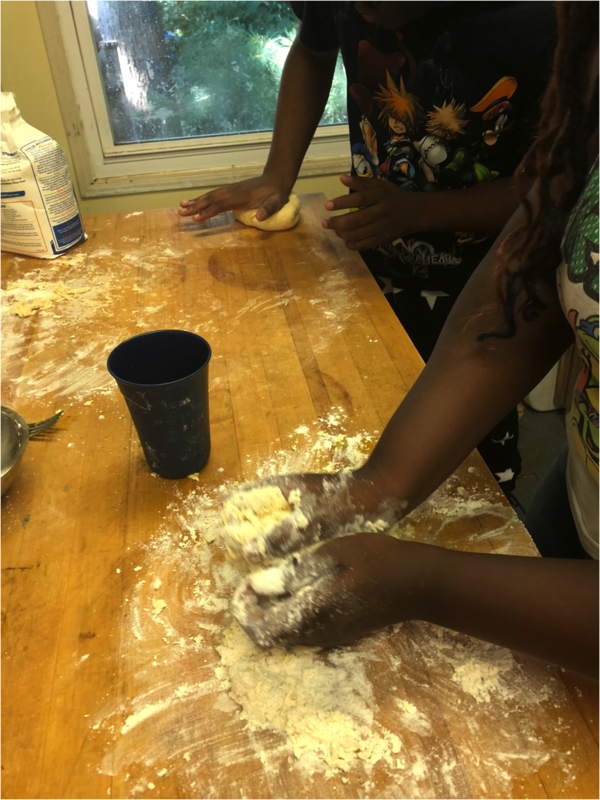 TLC expanded our summer team’s reach by forging a new partnership with local non-profit Food Moxie, (formerly Weaver’s Way Community Programs) whose mission—to educate and inspire people to grow, prepare, and eat healthy food—dovetailed perfectly with TLC’s. Food Moxie educators joined with our crew for part of each week to offer the opportunity grow an African diaspora garden near the Weaver’s Way farm, and to teach about and cook meals that connected our harvests to this diaspora and the flavors and traditions of a variety of cultural foodways. The Food Moxie crew also facilitated youth engagement and planning sessions for the third annual “Gather for Good” conference, which was again co-hosted by Food Moxie and TLC @ Awbury at the TLC farm and Awbury Education Center at the Ag Village. Our teams invited youth from around the city who were working in urban agriculture to attend and participate in sharing skills, making products, cooking a meal, and giving presentations. TLC members planned and prepared all the food, made signs to welcome and direct the attendees, and hosted tours of the Awbury Agricultural Village. They made smoothies in a blender powered by bicycle. They picked herbs and used them to marinate the vegetable kebobs and to season the lip balm that they taught other youth to make. As summer transitions to fall, we move to afterschool and Saturday sessions, and to planting greens, harvesting the last of the season’s tomatoes and planning what products we can make and sell you for your holiday gift giving. 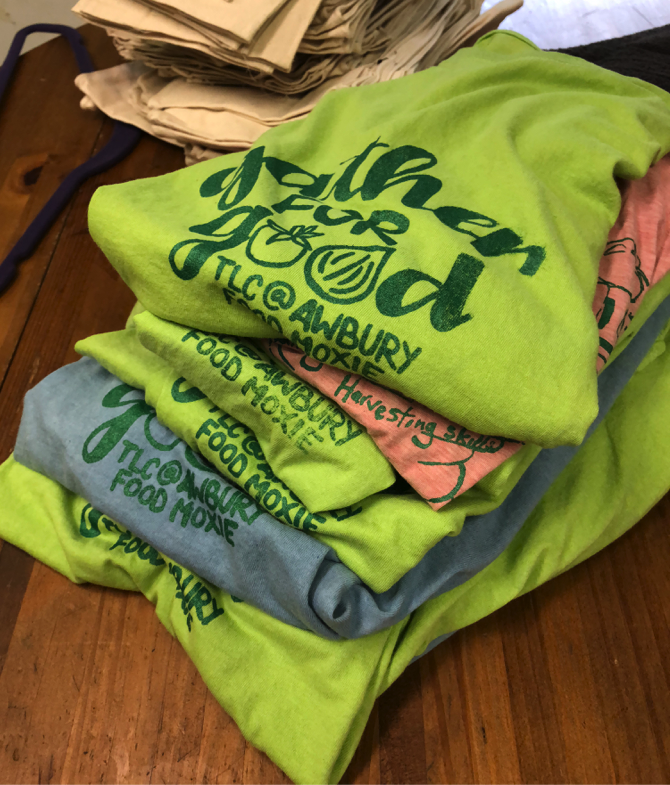 Look for TLC produce and products at the Awbury Harvest Festival in October and the Annual Holiday Greens Sale in December! Dan Sardaro grew up in North Wales, PA and will graduate from LaSalle University this year with a degree in Public Relations. 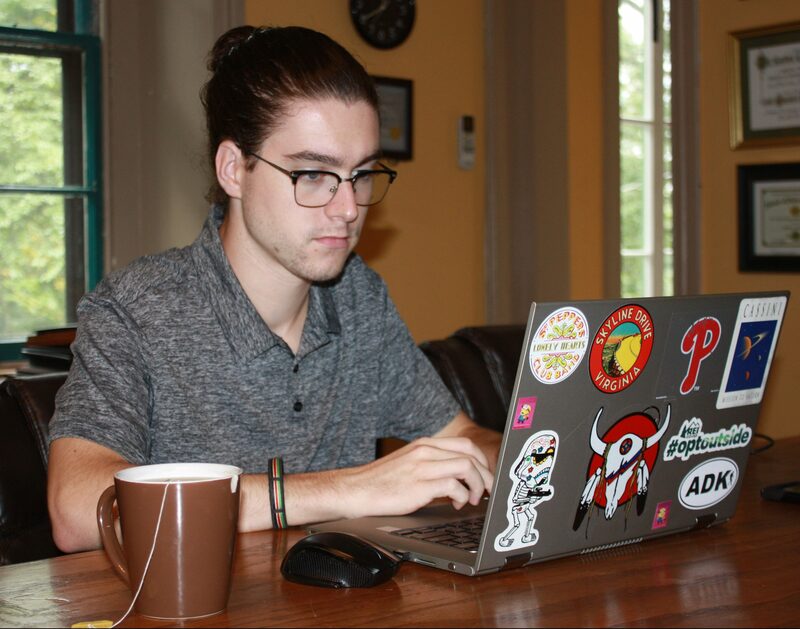 Originally interested in journalism, he wrote for his high school newspaper, but eventually decided, after some research, that PR would be a good fit for him. His first college internship was with a PR firm, Communications Solutions Group in Jenkintown. Awbury was his second internship. He learned of Awbury from a classmate who had been an intern here, and, on a whim, reached out to the Arboretum. Program Director Heather Zimmerman got back to him directly, saying they were short-handed and could use some help, so in late January of this year, he found himself writing the blog posts for the Year of the Pollinator and making sure Awbury had a distinct presence on social media. When Awbury offered him a position this summer, he jumped at the opportunity. He says, “I like my job at Awbury because it’s something I excel at: it’s writing, it’s education, it’s community outreach. But it’s also stewardship for the environment.” In addition to his monthly blog posts (which you can read here), he posts updates about events at the Arboretum on Facebook, Instagram, and Twitter. He also writes our press releases for the local papers. 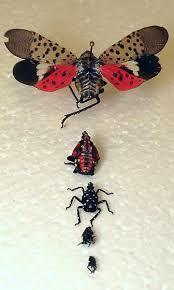 After the Year of the Pollinator is over, he hopes to continue writing the blog on different subjects. I grew up in Richmond, Virginia; from there I wound up going into the services for 26 years. I met my wife in college (I went on the GI Bill, but I didn’t finish college); we got married and came up to live with her parents in Philly to get started. I got a job in the city working for the Philadelphia Housing Authority. I worked there for 20 years. 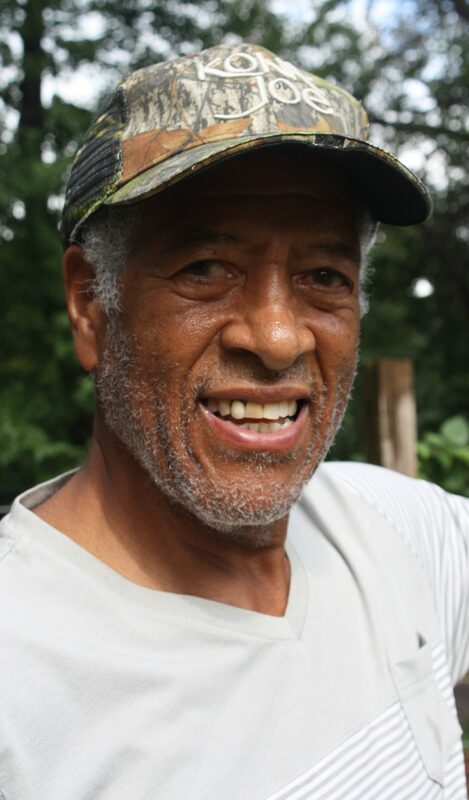 After I retired I ran into some people that were doing gardening at Awbury [in the Community Garden]. I live about five blocks from here. They said, “Why don’t you come down here and get a plot, too?” I did a little gardening with my parents and grandparents when I was young; I planted easy stuff then: peppers, corn, tomatoes. So I got a 10’x20’ plot for $20 at Awbury in 2007. I took a course to become a Master Gardener in 2012 and I keep busy [with volunteer work]. 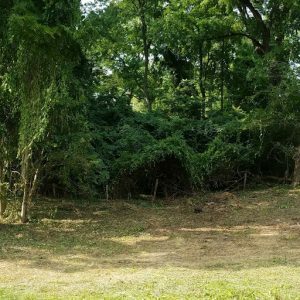 I work with the Philadelphia Orchard Project [POP]: I plant trees, pull weeds, clip trees for the following year, and clear the ground around the trees. I also work at the demonstration Edible Garden at the Pennsylvania Horticultural Center, growing vegetables, pulling weeds, cleaning the ground, helping with the volunteers—helping them tell the weeds from the crops. 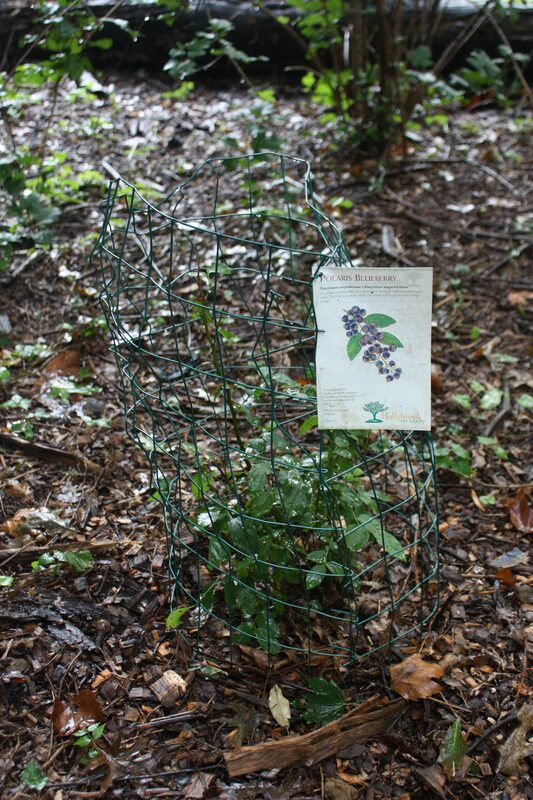 I also work on the Pollinator Garden [at Awbury]. You know, I’ve been involved with Awbury for the last ten years: I’ve been a member of the Community Garden for ten years and [its] president for five years. I’ve spearheaded the Community Garden to its three blue ribbon awards from PHS for best community garden. As a member of the Master Gardening program and POP, I work with the various organizations involved with Awbury Ag Village. 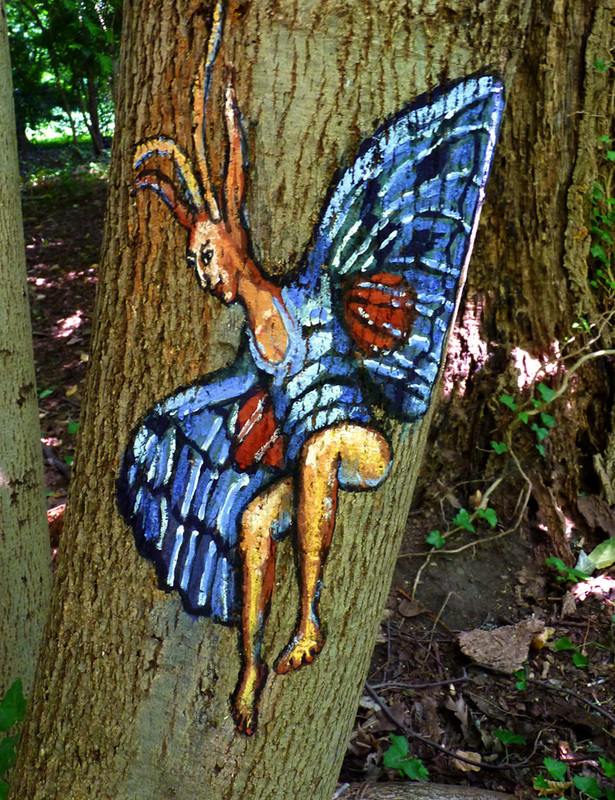 [Children] come in [to the grounds at Awbury] and get so excited. 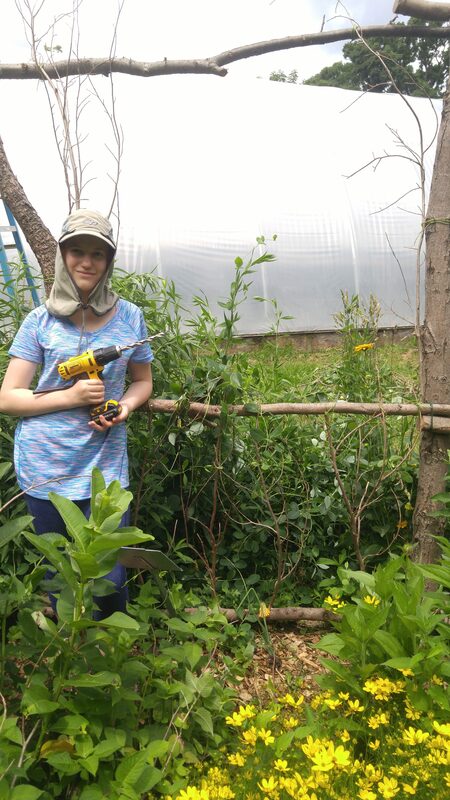 There’s something about gardening—when you see young folks getting their hands dirty, growing things, they get excited. I say, “This is where your food comes from.” … My favorite season is … when the South American birds come in. It’s like a rainbow of colors. It’s an oasis in itself right down in here. It’s a hidden secret. 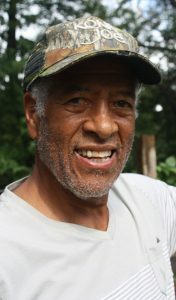 I would very much like to work with the Board on stewardship, connecting with and educating the community on the value and importance of Awbury Arboretum. I say the future is the youth who volunteer in maintaining the Arboretum. It gives them the knowledge of how plants, flowers, and vegetables grow and develop. This is most important because we have to look out for young folks and get them more involved. That should be our goal: pulling in young people, …giving them a work ethic, getting them to put stuff in the ground and see it come up. 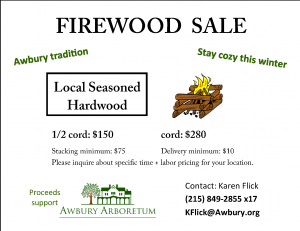 Interested in ordering firewood? Click here! Curious about the family that lived at Awbury a century ago? Appreciate the Victorian landscape design and want to learn more about it? Looking for ideas for good native plants to grow in your own yard? Consider taking a tour! The Arboretum now offers staff-led tours for groups. 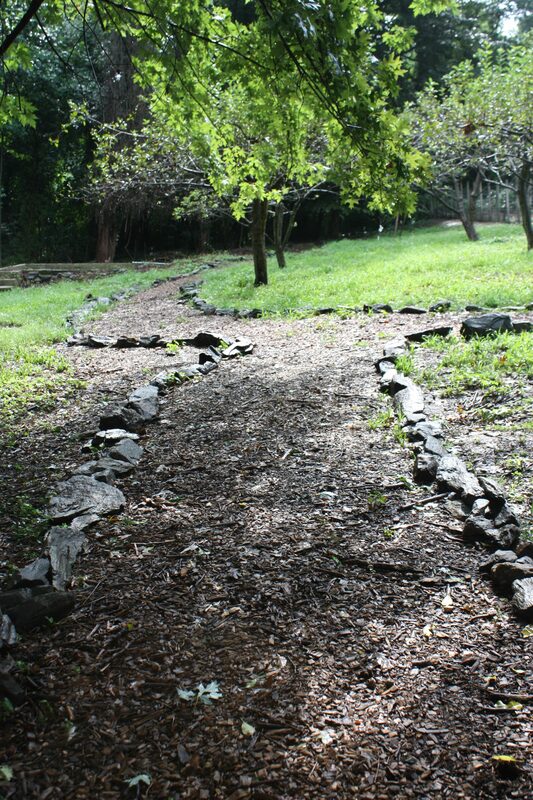 The experience begins with a PowerPoint presentation that introduces visitors to the Cope Family and English Picturesque landscape design, then continues with a walking tour of the property. Click here for more information and pricing on guided tours.